Knitting a pattern where two or more colours repeat continuously across a row uses a method known as Fair Isle. Our experts have got for you some top tips, ways to avoid the pitfalls and the 6 best ways to make sure your finished Fair Isle knitting is smooth and lies flat. Knitting Assistant Freddie Patmore demonstrates how to get your Fair Isle looking wonderful in our video. So, how easy is it to knit your own Fair Isle? Tina Egleton, our technical knitting editor, has some advice on how to knit a Fair Isle jumper. ‘I find Fair Isle quite easy to do – especially quite traditional patterns as you only use two colours at time. The repeats are symmetrical so they are easy to remember once you get going. Tina says: ‘I love knitting with the proper Shetland wool because the nature of the yarn is such that it interlocks the pattern so nicely. 1. It might sound silly, but when you are working with more than one colour at a time, try keeping the balls of yarn separated, with one ball sitting on your right and one on your left. This will make it really easy to keep an eye on any twists and tangles that may form as you work. 2. Always strand yarns loosely at the back of your work. This will ensure your knitted fabric remains stretchy, smooth and its intended width. If you aren’t sure how tightly you work your Fair Isle check your tension before you begin a new project, as this will help you decide if you will need a larger or smaller needle. You can help to maintain an even fabric by making sure that your stitches on your right-hand needle are always spread out and don’t become bunched-up. 3. Good Fair Isle comes with practice and repetition, so don’t be disheartened if it’s all a bit wobbly to start with. The trick is finding a comfortable way to hold your yarns as there are lots of different ways – one yarn in each hand (shown below), both yarns in your right hand, or simply holding one at a time (which is known as stranding). There is no right or wrong, it’s simply a personal preference. 4. If working the stranding method, prevent twisting by selecting one colour that will always be picked up from above the other, and vice versa. For instance, in the above picture we’ve opted for the green to be picked up from above the purple, and when we come back to using the purple we’ll make sure that the purple is picked up travelling underneath the green. 5. If one of your yarns isn’t used right until the very end of a row, carry it along the back of the work to the row end and catch it in with the colour currently in use. This will ensure that your entire length of knitting has yarn travelling at the back of the work, so that all of your work remains the same thickness. 6. When you’ve finished knitting all your Fair Isle pieces before you sew them up, give each piece a gentle press. Your yarn label will carry recommended pressing instructions so it’s always best to follow what it says. If unsure, just pin out your finished pieces to their intended size and lay a damp cloth over the top to dry. This is a more gentle way to press your knits. The drawbacks is if your stranding is too tight you create fabric that will pucker up. It wouldn’t be advisable for a beginner to start with a Fair Isle, but once you master the basics of knitting you can start on a simple colour pattern and then move onto something more advanced. The last thing you want is for your garment to look puckered. If that's what’s happening, then you’re carrying the yarn not in use too tightly along the wrong side. Carrying the yarn across the wrong side is called stranding. You need to allow enough slack when stranding to allow the pattern to lie completely flat. The way to do this is to make sure that the stitches you’ve just worked are stretched out on the needle before carrying the yarn not in use across the back and working it into the next stitch. Just straighten the stitches on the needle so they’re the correct width for how the pattern should look and you’ll avoid any tightness or puckering and your garment will be neat and, importantly, flexible. But you’ll need to make sure you don’t have too much slack in the strands of carried yarn as, when the garment’s finished, they can snag on your hands when you’re putting it on. And too much slack also means a waste of yarn! You can avoid the problem of slack in the strands of carried yarn by weaving them into your knitting. 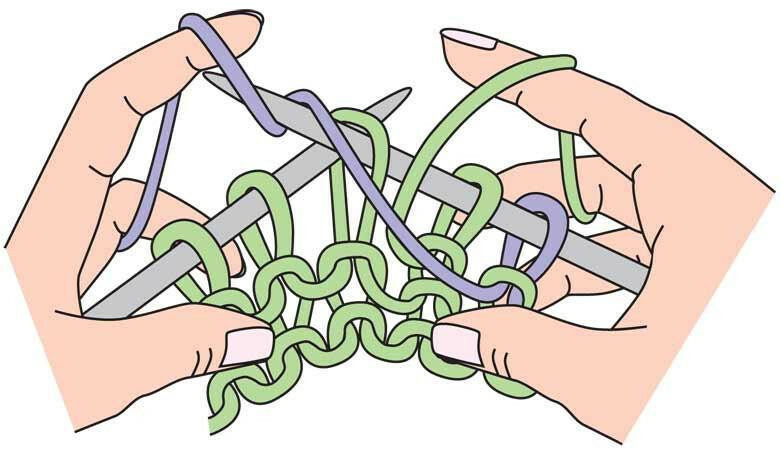 And you should really be doing this if your yarn is going to be stranded over more than 3-5 stitches. All you need to do is catch the stranded yarn on the wrong side with the yarn you’re using. Simply knit one stitch and cross the stranded yarn over the working yarn to catch it in place. Continue until you need to weave again, only this time cross the carried yarn under your working yarn. As always, practice makes perfect! And we recommend you try a little swatch before starting a project proper.